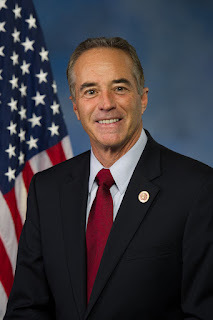 WILLIAMSVILLE, N.Y. -- Congressman Chris Collins (NY-27) today toured Stein Farms to discuss dairy issues he has been leading in Congress that deal with the decline in milk consumption and economic challenges facing dairy farmers. Collins announced a letter he sent with 11 of his colleagues to the United States Department of Agriculture (USDA) Secretary Sonny Perdue encouraging the agency to continue advertising campaigns like "Got Milk?". "Years ago, messages that resonated with all Americans included 'Got Milk?' and 'drink milk, love life,' and we saw some of our favorite celebrities with milk mustaches," said Collins. "The fact is, this type of marketing works. In recent years, we've seen an overall decline in milk consumption, which has created tough economic times for our dairy farmers and we are hoping Secretary Perdue can provide some additional help." Milk prices have dropped over 9 percent since 2014, and are expected to continue to decrease given the decline in milk consumption and Canada's unfair trade practices. The bipartisan letter voices support of USDA's Agricultural Marketing Service (AMS), which is responsible for programs dedicated to educating consumers and increasing the consumption of fluid milk. Past AMS campaigns successfully helped push the consumption of milk as it competes with other beverage products on the market. Collins' letter requests that the USDA not only continue these programs but also look for other ways to boost our nation's dairy industry and has the support of members from across the country. "I care about the struggling dairy farmers across our district, and I am proud to stand with them through difficult times," said Congressman Tom Reed (NY-23). "Low milk prices and unfair Canadian dairy tariffs are causing tremendous harm. I am happy to urge our Agriculture Secretary to pull out all the stops so that we can provide relief for dairy farmers." "After traveling across the district and meeting with numerous people in the dairy industry, I understand the problems they face each day," said Congresswoman Claudia Tenney (NY-22). "Farm milk prices are dropping at an alarming rate and in order to stop this trend, we are asking Secretary Perdue to look into ways to boost our nation's dairy industry and promote dairy consumption. The dairy industry is the backbone of our rural communities and I encourage the USDA to work to support all of our vital dairy farmers." "Dairy farmers play a vital role in Ohio's agriculture economy," said Congressman Jim Renacci (OH-16). "It is important that we continue to look for ways to promote the dairy industry and protect the dairy farmers who are so important to our local economy." "Dairy products are nutrient-rich and have many positive health benefits for consumers. It's essential that American families are informed about the positive health benefits of dairy products so they can make the most-informed consumer decisions," said Congressman Sean Duffy (WI-07). "That's why it's imperative that the USDA continue to their efforts to raise awareness through the Dairy Research and Promotion Program. Secretary Perdue has been an incredible ally for dairy, and I am hopeful that he will continue to work with us to make sure families know of the dairy options available to them." "Dairy farmers across the country are struggling to stay afloat in the face of low milk prices and new trade threats. While there are no easy solutions to these challenges, USDA has played an important role in spurring demand for dairy through advertising and marketing campaigns made possible by dairy checkoffs," said Congressman Peter Welch (VT-at large). "I encourage USDA to continue supporting these efforts, and will do all I can to keep supporting the industry." Representing one of the nation's leading dairy producing districts, Collins has been a strong advocate for issues related to nutrition, labeling, trade, and immigration as they impact our nation's farmers. "I want to thank Congressman Collins for helping raise the awareness of the situation dairy farmers are going through right now, and his help in showing New York consumers the benefit of having dairy as part of a healthy nutritious diet," said Dale Stein, owner of Stein Farms. "So have that extra glass of milk, that serving of cheese and yogurt. Enjoy that ice cream on a hot summer afternoon and know in doing so you are also helping your local dairy farmer." Collins added: "I thank Dale Stein for hosting today's event and look forward to working with my colleagues and Secretary Perdue on promoting one simple message, drink more milk."